Luton Town set a new club record of 12 Football League games unbeaten on their travels with a superb 1-0 win at Bradford City this evening. More importantly, with promotion rivals Barnsley and Sunderland playing out a goalless draw, it meant the Hatters moved five points clear of the Tykes once more and nine ahead of the Black Cats in third with just nine games to go. The visitors named an unchanged side for the clash, although Harry Cornick replaced Jason Cummings on the bench. After being held to a goalless draw on Saturday at Plymouth, there was no blank for the Hatters this time, moving in front with just 16 minutes on the clock. Andrew Shinnie was the architect, holding the ball up and playing a perfectly weighted pass for the overlapping Jack Stacey to take a touch and clinically beat Richard O'Donnell. The full back almost had a second moments later, found by James Collins this time, as his blast was parried by O'Donnell. The home keeper was soon in action again, acrobatically parrying Shinnie's 30-yarder away, with the midfielder curling wide and then Elliot Lee nodding straight at the increasingly busy Bantams stopper from close range. City somehow didn't level just before the half hour when a corner was flicked on by Hope Akpan with Nathaniel Knight-Percival unable connect at the far post. The visitors were forced into a change on 32 minutes when Alan McCormack went down holding his leg and couldn't continue, Luke Berry on in his place. Hatters pushed for another goal, with Stacey overlapping once more, his cross just in front of Lee, with the resulting corner glanced over the top by the unmarked Collins. Luton should have doubled their advantage straight after the interval, Berry doing wonderfully to dig out a cross on his left foot, only for Hylton to direct his free header over. City then had a decent spell, Luton called into some desperate defending, with James Justin appearing fortunate not to concede a penalty for a pull back inside the area. Collins twisted and turned to unload an effort that flew narrowly over, with Bantams' threatening from range, Akpan just off target. 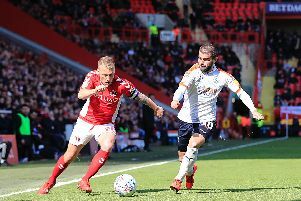 Shinnie was required to make a brave clearing header as City looked to have a man over, while Luton, for whom Dan Potts went close, set about seeing the final moments out with real professionalism. They did just that, on a bog of a pitch and in conditions that were getting worse by every passing minute, to take yet another huge step towards the Championship. Bantams: Richard O'Donnell, Adam Chicksen, Anthony O'Connor, Eoin Doyle (Omari Patrick 85), Jacob Butterfield, Jermaine Anderson, Hope Akpan ©, Nathaniel Knight-Percival, Paul Caddis, Lewis O'Brien, David Ball (Billy Clarke 78). Subs not used: Ben Wilson, Paudie O'Connor, Jack Payne, Jake Maltby, Josh Wright. Hatters: James Shea, Jack Stacey, James Justin, Matty Pearson, Sonny Bradley (C), Alan McCormack (Luke Berry 32), Pelly-Ruddock Mpanzu, Andrew Shinnie, Elliot Lee (Dan Potts 74), James Collins, Kazenga, Danny Hylton (Harry Cornick 82). Subs not used: Harry Isted, Alan Sheehan, George Moncur, Kazenga LuaLua. Booked: Knight-Percival 7, Anderson 41, Potts 90, Stacey 90.